The Save the Tigris Campaign participated on 15 and 16 February in an international workshop in Basra, entitled “Basra Water Crisis, Shatt al-Arab Increasing Salinity and Measures to Control”, organized by the University of Basra in collaboration with the Province of Basra, under the patronage of the Basra Governor Dr. Al-Nasrawi. National and international experts, such as academics, consultants and governmental advisors, discussed their experiences and possible solutions to the city’s persisting salinity crisis. Four key topics were addressed during the workshop: economy, agriculture and environment; shortage in water resources; present and future requirements; and Tigris-Euphrates Rivers Basin dialogue. Basra is the point where the Tigris and Euphrates rivers unite into the Shatt al-Arab. In recent times, the city has been facing a serious fresh water shortage due to a decreasing river level, which resulted in salt water intrusion. The salinity levels of the Shatt al-Arab increased more than five-fold in the last month, as total dissolve solids, which measures water purity, increased from approximately 1000 to more than 6000. Although there are several causes related to this issue, the problems started in the 1990s as Turkey built several dams on the Euphrates river. As part of its GAP project, Turkey is now finishing the construction of the Ilisu dam on the Tigris river, which will have a huge impact on Iraq’s water provision. It will reduce fresh water levels in Tigris river by 25%. This impact will be mostly felt at the downstream end of the river, at which lies Basra. A further reduction in fresh water levels would even more increase the salinity levels in the Shatt al-Arab. Therefore the impact the Ilisu Dam, and to stop its construction, is most relevant for the city. 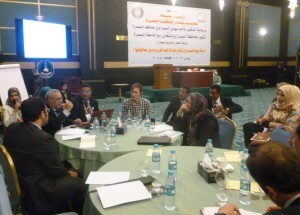 The Save the Tigris Campaign urged participants to address the issue of the Ilisu Dam, which will exacerbate the existing water problem in Basra. Experts during the workshop expressed their concern for dams such as Ilisu which are (being) constructed on the Tigris river basin outside of Iraq’s borders, in Iran and Turkey. They recognized the lack of data when it comes to future projections of the water quantity and quality in the Shatt al-Arab and the Tigris river. Academics expressed the need for an agreement between Turkey and Iraq based on equal shares of Tigris river waters, including an agreement on the quality and salinity levels of the water Turkey plans release downstream from the Ilisu Dam. However, there is currently no agreement within sight. Turkey does not take the issue of the Ilisu Dam and the impact on its neighbors seriously, and this is partly due to the fact that a thorough impact assessment of the Ilisu Dam is lacking. Such a study could provide the Iraqi government with an important tool to negotiate, hereby strengthening Iraq’s position vis-à-vis Turkey. The Save the Tigris Campaign during the workshop called upon scientists and academics to produce an assessment of the Ilisu dam’s impact on water provision for Basra and Iraq, which could be an important tool to address the problem of the Ilisu Dam at the highest political level, between Turkey and Iraq. Overcoming water shortage remains one of Iraq’s main challengesHasankeyf: Open-air Museum or Last Frontier for Diving?